Hey everybody, this is just a short post to show my new stamp and fabric! 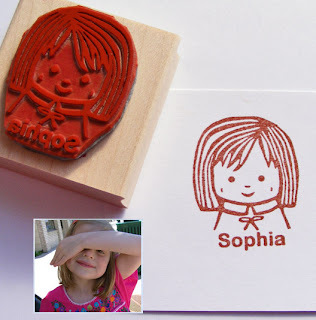 The designs are the same as in my hand carved stamps but they will come on a regular red rubber material, making them more durable and more professional looking, the wood is better too and for a more comfortable grip when stamping. The nice thing is that they will still look hand carved, I can make the font a little shaky too but my daughter wanted a more "clean" looking font. 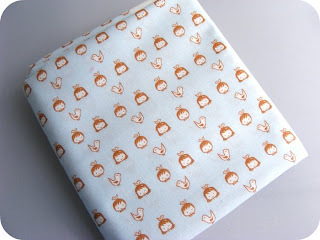 And here is my new custom printed fabric that I ordered from spoonflower. It is wonderful! And I will have some fat quarters available in the shop. i will definitely be by to get some of that fabric, absolutely adorable! Both are so cute! I am constantly amazed at your adorable stamps. Really cute, both of them. Love your stuff! These are wonderful! Thank you for sharing the fabric link...I've had several of my designs manufactured with fabric Co.'s ~ but LOVE this idea of choosing my own! I love the new fabric - great job! Your work in general is so beautiful!!! You are my inspiration hero today!